Remarkable show played in remarkable weather. 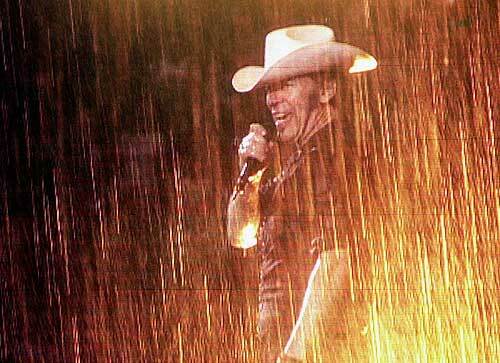 The rain begins to pour down during the full band “The River” and continues for several songs, punctuated with incredible thunder and lightning. A unique “Follow That Dream”. Many other highlights – an Italian story in “Growin’ Up”, the rain sheeting down in “Waitin’ On A Sunny Day”, “The River” and an impromptu “Who’ll Stop The Rain”. Jon Landau plays guitar on “Dancing In The Dark”. First ever performance in Italy of “Follow That Dream”. “Born In The U.S.A.” from the soundcheck is solo acoustic. Released on “Once Upon a Time in Italy” and “San Siro Night” (Crystal Cat). Several DVDs available, including the excellent screenshot “Blood Brothers On A Stormy Night” (brucevideos), plus many others.